Why Blame Constitution of India for Gender Biased Laws? It is now wide spread that India is country of gender Biased Laws especially when it comes to matrimonial matters. Any matrimonial dispute in India is now seen as a criminal offence and the courts & police has been allowed to peep into the bedroom of couple & family by the Government of India. The argument put forth by Government or judiciary for creating this gender imbalance in country, is that Constitution of India allows special provisions for special category. Yes, it is true but what about enacting special provisions for special category by oppressing other category’s basic & fundamental rights?, definitely it was not the spirit of our Constitution. Special provisions can be made for a special category in society to uplift that category by providing economical, educational, social or infrastructural benefits, but to grant legal impunity or undue benefits to someone on account of being special category is surely defeats the purpose of justice itself and this is the trend that Indian Government is following. In this process, the Government has put on stake the very basic unit of it’s society i.e. the family, which was once, the pride of belonging to an Indian society has now been turned into a sense of guilty(of being wife beater or dowry seeker) by enforcing more & more gender biased laws which Constitution of India never envisaged. It’s simply a power & vote bank game for Government alongwith getting easy foreign funding on concocted figures and stats. This appeasement of a section of society on gender base by turning blind eye to the other section which as a result gets oppressed has created a dangerous imbalance in gender equality in nation. The Government in this regard, has forgotten that with any individual of a particular gender there are many others connected /dependents of opposite gender. So, covering one in special category to provide undue benefit automatically makes many others discarded of same gender. Here it is to be realized that the Constitution of India assures its citizens of justice, equality, and liberty and to promote among them all fraternity and It lays down the framework defining fundamental political principles, establishing the structure, procedures, powers and duties, of the government and spells out the fundamental rights, directive principles and duties of citizens. But Indian Governments rather than discharging its duties of tackling social & other problems through its machinery & resources is seems to be panelizing & oppressing one section of society on gender base by entangling and throwing all &every responsibility/blame on that section . The end result is that India no more can be called a “Welfare State”. 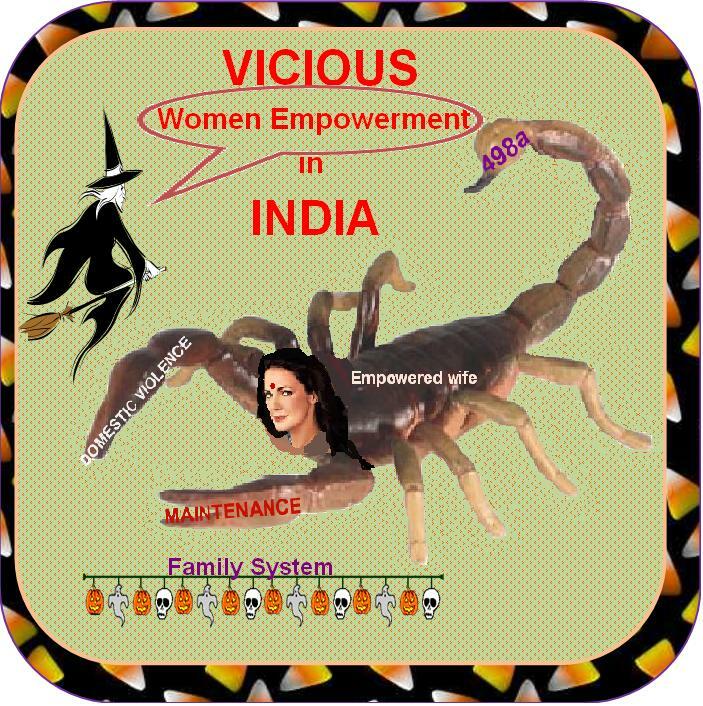 These laws( legal tools) has made India a nation where Innocents are suffering and are crying for justice but judiciary is tossing onus on legislations and both are passing it to the Constitution of India, forgetting that Constitution of India has not given authority to anyone to oppress more than 50% (male) population of the society for the sake of pseudo women empowerment or women upliftment. Now, India has reached at a stage, where the Government & judiciary should stop making excuse of Constitution of India and should realize their duty of safeguarding the true spirit of Constitution of India in order to prevent further public unrest or Jungle Raj.